Table of the Comparative Heights of the Principal Mountains & c. in the World. 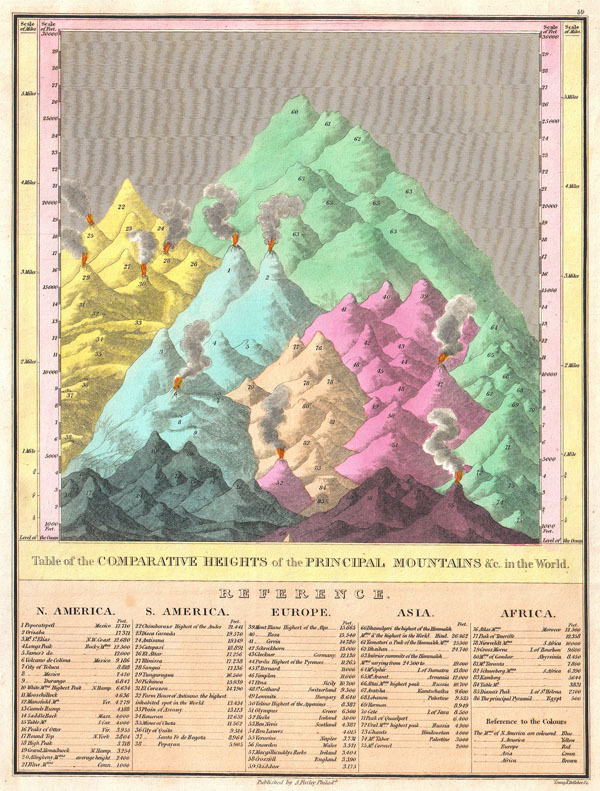 This is Finley's attractive c. 1826 map of the comparative heights of the principal mountains of the world. Details the world's great mountains in relative proximity to one another and divided by continent. Each mountain is numbered and refers to a reference list below the chart proper, naming each mountain and its elevation. Also notes important cities, mines, volcanoes and geographical locations, including the Great Pyramid. The highest mountain in North America is Mexico's Popocatepetl, in South America it is Chimborazo, in Europe Mont Blanc, in Asia Dhaulagiri, and in Africa the Atlas Mountains of Morocco. Predates the discovery of Everest, Kilimanjaro, Mt. Kenya, and Mt. McKinley (Denali). Prepared by Young and Delleker as plate no. 59 in the 1826 edition of Finley's New General Atlas. A New General Atlas Comprising a Complete Set of Maps, representing the Grand Divisions Of The Globe, (1826 editon). Very good condition. Thick stock. Blank on verso. Rumsey 0285.062 (1831 edition). Phillips (Atlases 760-59).